A delightful setting of gentle breezes, brilliant sunshine and air redolent of salt—these are a mere portion of the pleasures intrinsic to ocean homes. It is the tranquility, the sense of being apart from the rest of the world that draws the discerning to the live by the ocean. Adding to that serenity is the indulgence of a pool. Cool and enticing, a pool beckons, offering cool respite on a hot summer day. Yet not just a pool of any design will do. Coral makes the difference. Creating a luxurious ambience, coral stone is the perfect composition for a pool in which splendor is the desired effect. Its beauty alone makes coral a grand choice. Part of that beauty is displayed in the wide range of tones, offering colors that add richness to a pool while the natural imprints shade it with character. Moreover, sumptuous textures inject a wonderfully tactile aspect to coral. Simply put, coral is elegant. It is that texture that makes coral stone such an excellent choice for both the pool coping and the pool deck. Deftly melding the swimming pool edge with the pool deck, the pool coping takes on an element of safety with the non-skid texture of coral. Likewise, featured on the pool deck, this stone’s texture prevents slipping and falling on its wet surface. Additionally, its ability to retain its coolness even in the most scorching heat makes coral supremely comfortable as well. 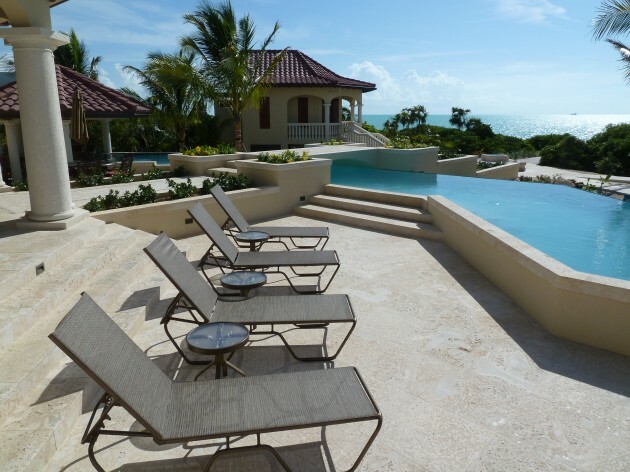 Offering the highest caliber of quality along with matchless beauty, a coral stone pool is the epitome of style and craftsmanship, making it very much in keeping with the quiet majesty of an ocean home.